New F1 sponsor ROKiT says it was approached by several teams for a 2019 deal, but ultimately settled on Williams after a 45-minute meeting with its deputy team principal. 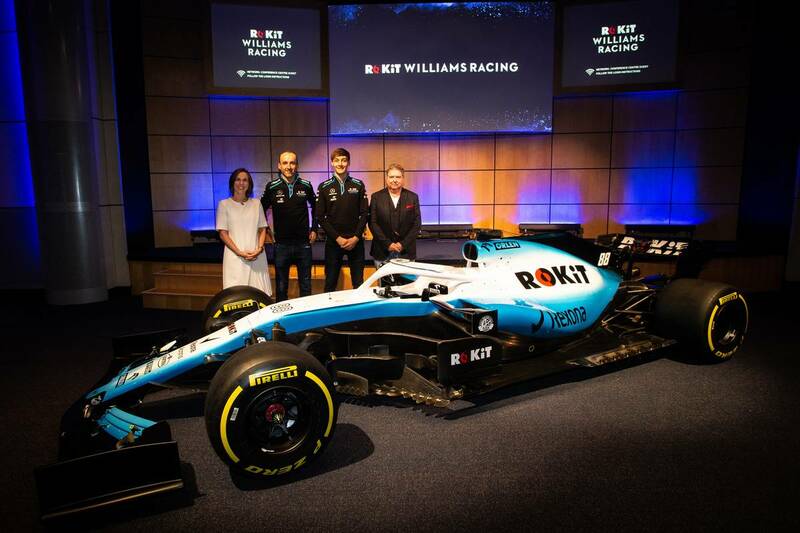 Williams introduced yesterday a new-look livery linked to its new title sponsor ROKiT, a new global telco company, that replaces Martini as the Grove-based outfit’s major commercial partner. ROKiT co-founder Jonathan Kendrick was keen on securing a global platform on which the company can promote its products, and Formula 1 evidently fit the bill, with several opportunities. “We were approached by three or four other Formula 1 teams when they realised we were in the market,” said Kendrick at yesterday’s launch. “And the reason we’re with Williams is it’s British, I’m British, my company’s British. “I love the fact that the Williams name has been above the garage now for a lot longer than other teams that are not here anymore: Tyrrell, Lotus, BRM, Cooper, Brabham – Williams is still standing. “That was one reason. And the other reason quite bluntly is this lady here, Claire. Claire Williams obviously expressed her delight to welcome ROKiT onboard, and revealed what she believed had been the single most important thing that sealed Williams’ deal with its new partner. “Jonathan is a big fan of HP sauce, and he said to me when he was flying in, ‘I’m going to need a bacon roll with some HP sauce’,” she recounted. Kendrick also said that ROKiT’s involvement in F1 had brought him full circle with regard to the sport. “I was a Goodyear tyre engineer when I was 20 years old in Wolverhampton,” he explained. “And quite remarkably I was the tyre engineer for Alan Jones and Frank at the first race in Argentina. And 41 years later here I am as the title sponsor!